King James Bible (1611) - The King James Bible is the most popular version of the most popular book in history. It is named after King James I, the English monarch who commissioned its translation. Translation of the Bible into English was largely made possible by the Protestant Reformation. Until then, the Catholic Church kept a pretty tight grip on the Scriptures and required that they exist only in Latin. This made it impossible for the average citizen, who did not speak Latin, to understand the Scriptures, and thus dependent on the clergy for learning what the Bible said. 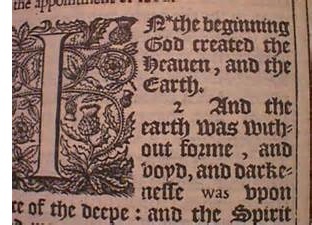 Before the Reformation, only one attempt was made to translate the Bible from Latin into English. That was done done by John Wycliffe around 1380. He nearly completed the New Testament before his death, but that was as far as he got. His translation was also banned by the church as heresy. Soon after the Reformation, a number of translations were undertaken; most notably by William Tyndale and Myles Coverdale. But the King James Bible was much more comprehensive than anything attempted before. James I gathered 47 scholars from the Church of England and work began in 1604. They translated from the oldest available sources in the Hebrew, Aramaic and Greek languages, and did not rely solely on the Latin Vulgate. Seven years later, in 1611, the King James Bible was completed. Within a century, it supplanted the Vulgate as the most popular Bible in English speaking churches and eventually became known simply as the Authorized Version (AV). Today it is most commonly referred to as the King James Version (KJV). Although numerous other translations have been made in modern time, especially since the discovery of the Dead Sea Scrolls, the King James Bible remains the most widely enduring version of the Bible in history. 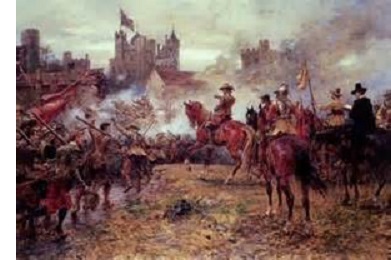 English Civil War (1642-1651) - Charles I became King of England in 1625. He was the son of James I and second in the line of the Stuart Dynasty. Queen Elizabeth never married insuring that the Tudor Dynasty would die with her, and potentially creating a succession crisis upon her death. Crisis was avoided, however, when James, the reigning King of Scotland was chosen to succeed her. He was the son of Mary, Queen of Scots and a descendant of King Henry VII, so he was regarded as the best choice to follow Elizabeth. Though his reign was relatively smooth, his son's was much more troublesome. Charles I subscribed to the "Divine right of kings" philosophy, whereby his power was granted to him directly by God, and therefore, he had the ability to rule as he saw fit. This quickly created problems with the British Parliament which did not agree with Charles' position. The schism led to what is known as the English Civil War (or sometimes as civil wars (plural) as it consisted of three separate conflicts. For simplicity sake, it will be referred to as a single war which had three phases). It began in 1642 with both sides trying to win as many supporters as possible. King Charles fled London which was largely hostile toward him and set-up his base in Nottingham. As a general rule, urban areas sided with Parliament and the rural population remained loyal to the king. The Parliament in session at this time was known as the "Long Parliament" in order to distinguish it from the "Short Parliament" which had been dissolved by King Charles in May, 1640. A new Parliament (the Long) convened in November of that year in defiance of the king. Both sides managed to raise initial forces of about 15,000 apiece. Robert Devereux, 3rd Earl of Essex was appointed commander of the Roundheads (the name given to the Parliamentary forces). He left London and headed north toward Nottingham, picking up recruits along the way. In Cambridgeshire a small cavalry force joined led by a man named Oliver Cromwell. The Roundheads grew to a size of about 21,000 infantry and 4,000 cavalry. Devereux positioned his forces between London and Nottingham. The first conflict of the war took place on September 23, 1642 between two cavalry units. It was a skirmish called the Battle of Powick Bridge. Royalists under the command of Prince Rupert, the king's nephew, were victorious. A month later, the first major encounter, the Battle of Edgehill, was fought. It was considered inconclusive. However, Tunham Green, in November forced Charles to retreat to Oxford which became his new headquarters. For the most part, the Cavaliers (the name given to Royalist troops) gained the advantage in the early part of the war. Things began to turn, though, during the summer of 1643 which is about the same time Oliver Cromwell began to distinguish himself. He won the Battle of Gainsborough in July. Of course, his military prowess was not the only determining factor. Devereux broke a Royalist siege on Gloucester in early September which dealt a serious blow to the king. Shortly after, the Scots joined the war on the side of Parliament which was a major addition. 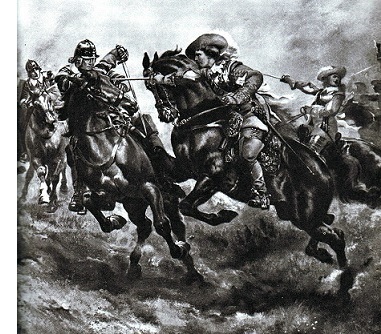 With their help, the Roundheads won the Battle of Marston Moor on July 2, 1644. They followed that up with consecutive victories at Naseby and Langport in the summer of 1645, which broke the Royalist forces. Oliver Cromwell had risen to second in command by this time and received a lot credit for their successes. King Charles held out for another year, but was finally captured in May 1646 and imprisoned. This ended the first phase of the civil war. Ironically, the second phase broke out when the Scots switched sides and and tried to help Charles regain power after he made an agreement with them known as "The Engagement". The second phase of the war was not so important for its length (it lasted about a year, most of 1648) or its battles (the Roundheads defeated the opposition without too much difficulty) as much as for the fact that it demonstrated King Charles could still rally support even from prison. As a result, after it was quelled he was tried for treason and executed on January 30, 1649. The third phase of the war (1649-51) was fought primarily in Ireland and Scotland and cemented Oliver Cromwell as the leading figure for the Parliamentarians (see above). It also saw the son of King Charles, Charles II step in to try to replace his father. He was initially unsuccessful, but upon the death of Oliver Cromwell, the monarchy was restored and Charles II made king. However, in the interim six years (1653-59), Oliver Cromwell ruled as Lord Protector, with what some would say was even greater power than what King Charles I had. While there have been other civil wars in England's history (most notably the Wars of the Roses), this one is distinguished from those in that it was fought over where power in government would be vested rather than who would be king. Additionally, though it is named after the nation of England, it encompassed the whole of the British Isles, including Scotland and Ireland.